The Japji by Guru Nanak is the foundation of the Sikh faith and basic Sikh scripture. Parts of the Japji or Jap Ji is included in daily morning prayers of Sikhs all over the world. This version of The Japji was translated by Kirpal Singh who was in the direct lineage of the author of Japji; Guru Nanak. Japji stresses the importance of brotherhood of man and leading a spiritual life as the key to salvation. 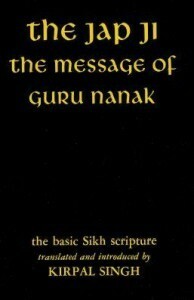 The foundation of the Sikh faith and basic Sikh scripture.